yallstore has no other items for sale. There are 545 items available. Please enter a number less than or equal to 545. This item took forever and was not all here and broken. Items a fake knock off very unhappy don't buy this!!! used the mop twice it's falling apart. 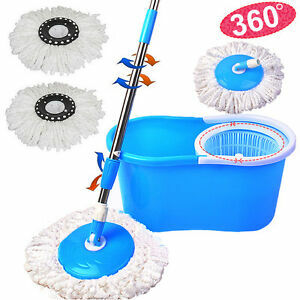 No wet hands, floor dries quickly, mop head is easy to change and economical. It's the only mop we want to use in our household since trying it. I love, love, love it. This is the only kind of mop I will ever use. Good product, worth every penny! I was very excited to try it out. I did have a problem putting the mop handle together, then getting the the mop head onto the handle. Then as I was mopping, when I went to spin the mop dry, I'm having trouble getting and keeping the mop on that center piece, in the basket of the bucket, so it will spin. Once the mopping was completed the floors looked very nice, I'm sure after a few more uses I'll be alright. Really love this . Easy to use.